No, it’s not another poem about Flash boys and luminous men, although there is potential there. “Flash” just means I wrote this in an instant right after the precipitating event. It’s even time-stamped. When people talk about me long after I’m gone — maybe even at dinner after the funeral — maybe they’ll have some fun trying to figure out what I meant by that. You see, I don’t generally have a reputation as a rosy optimist. 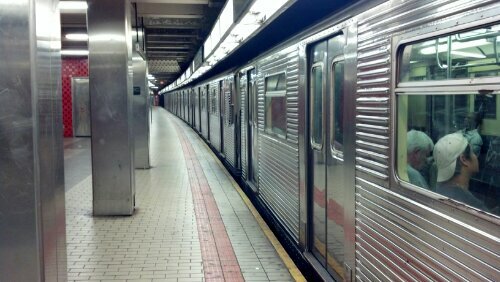 It’s my “Rosebud” moment. I went to a local convenience store yesterday and the kid — ahem, young man — behind the counter was wearing a Captain America t-shirt. I thought, well isn’t that exactly how you become a hero. Maybe not a superhero, that takes secret government programs, jacked-up spiders or exploding homeworlds. But you get my drift. Slightly off topic: I want to call dibs — Iron Man 4 with Jay Gatsby as the villain. I’m so writing that. 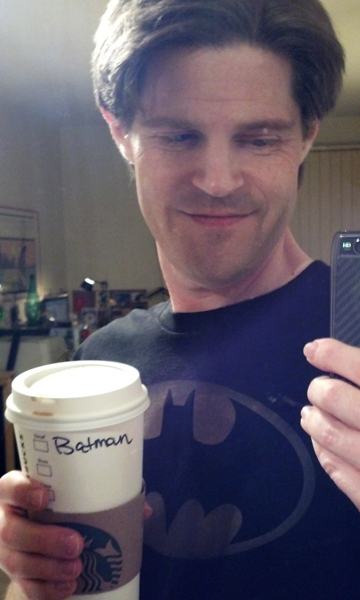 So that’s me holding a venti dark roast labelled Batman, instead of my name, by an observant Barista. I recently asked some folks the question “Superman or Batman?” and figured I’d answer it too. While I can see both sides (and I’m a pretty big superhero fan in general), if I had to choose one it would be Batman every time. I identify with Batman because he’s human and he’s not sure. It’s not a foregone conclusion that he’s always right, or even good. Characters in the Dark Knight universe refer to him as an idea but I think that’s a faulty word — he’s a template. Anyone can be the Batman. Even Michael Keaton, and Tommy from 3rd Rock from the Sun. (It has to be true, Christopher Nolan may or may not have said so). And Iron Man is a rockstar. Since December 1, 2011 I’ve been keeping a list of every movie I’ve seen — big screen, Netflix/Amazon, DVD or otherwise. As an (aspiring) screenwriter and a storyteller I try to watch a lot of different movies. In many cases try to take apart what the screenwriters do and figure out why they did it that way. In other cases I just sit back and watch stuff blow up (I’m talking to you, A Good Day to Die Hard). My recall is pretty good, so questions and debates are welcomed. Just don’t diss The Princess Bride, that’s all I’m saying. I’ll keep this list up to date, adding new movies at the bottom. Someday soon I might attempt a favorite movies list complete with mini-reviews. Now that’ll be a weird list of movies.